How to go to Izmir? What to eat in Izmir? Where to go in Izmir? What to do in Izmir? What to buy in Izmir? There are still many traditional houses and chateaus hidden away to discover though. 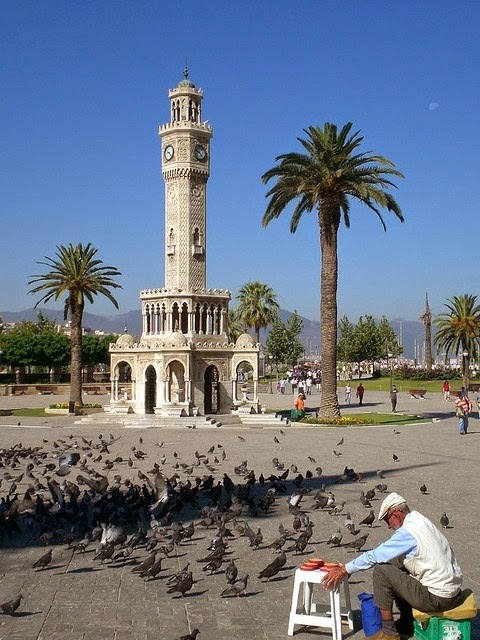 Izmir enjoys a temperate climate with mild winters and warm summers, which is probably why the street life is so lively. A walk on the Kordon reveals an endless line of restaurants, Bistros, Bars, Coffee shops and Tea Houses all spilling onto the street. In many cases so close together it is often difficult to know exactly which place you are actually relaxing in. A visit to Izmir can not be complete without spending a few hours wandering round the Market Area of Kemer Alti. This is a bustling Bazaar where literally anything can be purchased. It is a confusing warren of small allies, dead ends, connecting squares, shopping centers, offices, workshops, cinemas, Mosques and just about anything else you can think of, there is even a renovated Karavan Sarai hidden in there. You are pretty much guaranteed to lose your way, but don't panic you will find your way out eventually. The culture park in the Alsancak district hosts the annual Izmir International fair, held every year in September. The rest of the year many other fairs and expos take place also. In addition to serving the commercial needs of the city the Culture Park provides a relaxing green area in the middle of the city for the residents to lay back, drink tea play Backgammon and smoke a "hubbly bubbly pipe" (Nagile) or even exercise on the running track. The city of Izmir itself does not possess any beaches however a short journey to the North, East or South of the city will take you to either hustling tourist resorts, or quiet secluded peaceful beaches the choice is yours. The region has been inhabited since 3000 AD so the area is rich in historical sites, these can be found within the city (Kadifekale - Bayrakli) but also within a short drive you can find Efesus, Pregamum, Sardis, Teos and many more places to explore. Night life in Izmir is lively and getting livelier all the time, should you feel the need to rock the night away, you can find many modern Disco's and Night Clubs around all running into the early morning.